Brief Description: Make and create three different, radical robots! Cost: $50-100, or $100+ if a Lego WeDo set needs to be purchased. Dollar stores sell electric toothbrushes. Before purchasing pool noodles, measure the base of the electric toothbrushes to determine the width of the pool noodle to purchase. Most online stores list the width of the interior hole of a pool noodle. We set up one Lego WeDo set for children to build a project together. We gave them the choice between the Soccer Kick robot and the Sailboat. Together they built their chosen design and programmed it to move. To aid in construction and programming, we printed out the teacher’s instructions for the coding to make things run smoother. Tweens created a paper robot that lights up when a paper switch is pressed. This project was inspired by a kit found on Sparkfun.com. In the space of time between when we bought a sample kit, and offered the program (a matter of a few months), the product was discontinued. 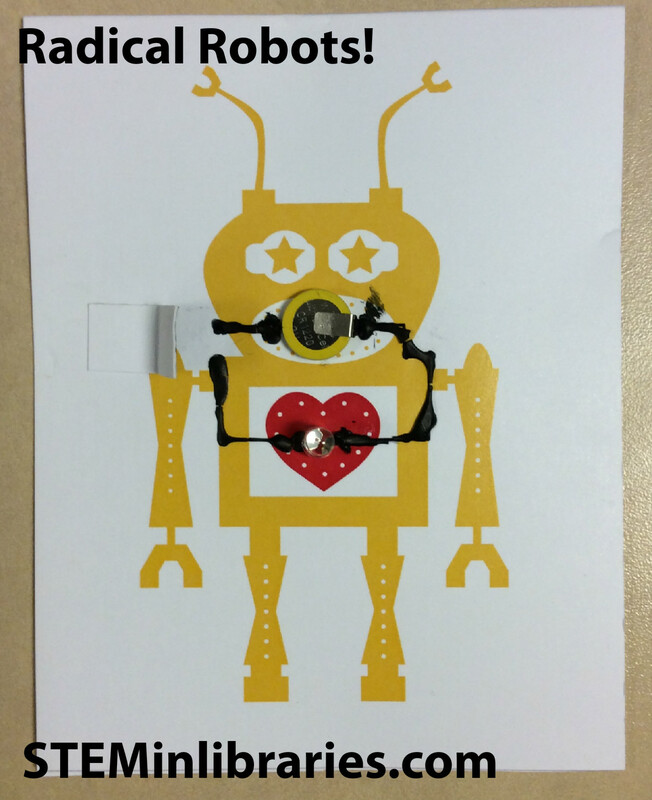 We were able to re-create the project by purchasing the supplies individually (which are still helpfully listed on Sparkfun’s site), and having the tweens either draw their own robots, or use a robot template found on BareConductive.com’s site. Sparkfun’s original instructions, created by bareconductive.com are no longer online, but can be seen via the Internet Archive Wayback machine. Bare Conductive also has online instructions which we found to be extraordinarily helpful. Tweens created Doodle Bots, a robot made of an electric toothbrush, a cut-up pool noodle, and markers. A colleague originally saw the Doodle Bot (called an artbot there) at a local networking meeting, and we adapted the design for simplicity’s sake. Our robots were made without taking apart the toothbrush (keeping it intact), and having the tweens fit the base of the electric toothbrush into a cut-up section of pool noodle (we had the tweens cut the lengths of pool noodles themselves, given them a ruler to measure how long a length of pool noodle they would need). Tweens then experimented with discovering how many markers to wrap around the pool noodles with a rubber band. Too few or too many markers resulted in a doodle bot that did not move. Note: Doodle Bots have been known to doodle out-of-control! Be sure to make your robots on a table lined with paper, or on a surface that is easily cleaned. All the activities in this program were very popular, and they also took much more time than we anticipated. Each activity could easily have been a program unto itself, and for future events we will most likely offer them individually. Only the Doodle Bot would benefit with being paired with a simpler, additional project, although even building Doodle Bots took some tweens almost 30 minutes to build. Each project, if offered separately, would work well for an older audience. Teens would find it interesting to see how they could modify and adapt the Doodle Bot, and the Robot Card, with its use of conductive ink, is different enough to maintain their interest. The Lego WeDo set might be considered a bit young for teens, but never underestimate the fun of playing with Legos. Some of the Lego WeDo projects are fairly advanced, and would be engaging. For a younger audience, each activity would work if it was presented as part of a family program. Younger children would benefit from having individual help from their guardians.